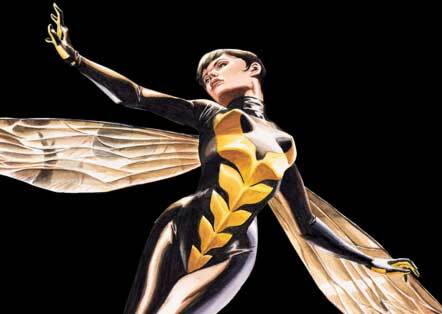 Could Evangeline Lilly Be Playing Wasp in ‘Ant-Man’? From Pepper Potts (Gwyneth Paltrow) to the Black Widow (Scarlett Johansson), it seems Marvel’s been careful to include a few female characters in each of its films, typically just active enough to avoid too strong a feminist outcry. After proving her action chops in The Desolation of Smaug, actress Evangeline Lilly could be the next in line fitting that bill. The only firm news seems to be that Lilly will play the female lead alongside Paul Rudd as Scott Lang/Ant-Man and Michael Douglas as scientist Hank Pym. The Variety report which broke the story cited unnamed sources suggesting Lilly’s character would be both Pym’s daughter and Lang’s love interest, though the report also mentioned that this would be a departure from the comics, where Pym does not have a daughter. One compelling possibility – and we’ll stress that this is nothing but our own speculation at this point – is that Lilly could be playing an adapted version of Wasp, Ant-Man’s partner in crimefighting and love interested in a long and troubled relationship (albeit to Pym’s Ant-Man rather than Lang’s iteration). Given that Wasp is closely tied to Pym in the comics (her father is Pym’s lab assistant), we don’t see it as too much of a stretch for the character to become Pym’s daughter and Lang’s love interest instead. If Lilly is indeed to play Wasp, the big question will become how and when she gains her powers – the character start as a normal human, but gains superpowers after an experimental treatment with the Ant-Man-enabling Pym particles. Ant-Man is being directed by Edgar Wright and will hit theaters July 17, 2015 as the first of Marvel’s Phase 3 movies.